1. (1.05) “Run & Gun” – The attempt by the escapees from the Macon plantation to catch a northbound train out of the state is complicated at every turn; while Tom and Susanna Macon have the remaining slaves – especially Pearly Mae, who was captured while trying to run – questioned about their plans. 2. 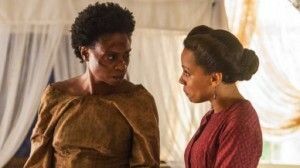 (1.09) “Black & Blue” – One of the escapees, former house slave Rosalee, is captured in a small Kentucky town and held at a slaughter house, while fellow escapees Noah and Cato plot to rescue her. Underground Railroad agent John Hawkes (who is also Tom Mason’s brother) learns of his wife Elizabeth’s reckless action to save the orphaned escapee Boo from her ex-fiancé and U.S. Federal Marshal Kyle Risdin. 3. (1.04) “Firefly” – A notorious slave hunter named August Pullman and his son Ben track Noah and Rosalee, following their escape from the Macon plantation at the end of the previous episode. The other slaves involved in Noah’s plot contemplate running, as well. 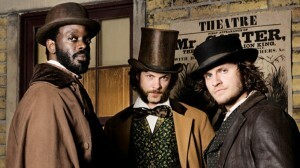 Meanwhile, John and Elizabeth face a lethal predicament, when one of the runaways they are sheltering turns hostile. 4. (1.01) “The Macon 7” – In the series premiere, Noah begins to plot an escape from the Macon plantation to the Ohio River and free states. He contemplates on choosing which slaves to be included in his plan, while dealing with a hostile Cato, who also happens to be one of the plantation’s field drivers. 5. (1.07) “Cradle” – This episode featured a collection of vignettes about the younger characters – all children – facing the harsh realities of the world in antebellum America. 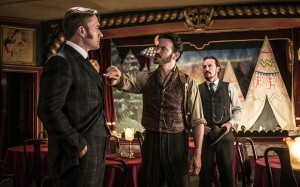 Warner Brothers is the last studio I would associate with a heartwarming family comedy set in the 19th century. At least the Warner Brothers of the 1940s. And yet, the studio did exactly that when it adapted Howard Lindsay and Russel Crouse’s 1939 play, “Life With Father”, which happened to be an adaptation of Clarence Day’s 1935 novel. If I must be frank, I am a little confused on how to describe the plot for “LIFE WITH FATHER”. But I will give it my best shot. The movie is basically a cinematic account in the life of one Clarence Day, a stockbroker in 1880s Manhattan, who wants to be master of his house and run his household, just as he runs his Wall Street office. However, standing in his way is his wife, Vinnie, and their four sons, who are more inclined to be more obedient of their mother than their father. You see, Vinnie is the real head of the Day household. And along with their children, she continues to demand that Mr. Day overcome his stubbornness and make changes in his life. Thanks to Donald Odgen Stewart’s screenplay, “LIFE WITH FATHER” focused on Mr. Day’s attempt to find a new maid; a romance between his oldest son Clarence Junior and pretty out-of-towner named Mary Skinner, who is the ward of his cousin-in-law Cora Cartwright; a plan by Clarence Jr. and second son John to make easy money selling patent medicines; Mrs. Day’s health scare; Mr. Day’s general contempt toward the trappings of organized religion; and Mrs. Day’s agenda to get him baptized. Some of these story lines seem somewhat disconnected. But after watching the movie, I noticed that the story lines regarding Clarence Junior and John’s patent medicine scheme were connected to Clarence Junior’s romance with Mary and Mrs. Day’s health scare. Which played a major role in Mrs. Day’s attempt to get her husband baptized. Even the baptism story line originated from Cousin Cora and Mary’s visit. Many would be surprised to learn that Michael Curtiz was the director of “LIFE WITH FATHER”. Curtiz was not usually associated with light comedies like “LIFE WITH FATHER”. Instead, he has been known for some of Errol Flynn’s best swashbucklers, noir melodramas like “MILDRED PIERCE”, the occasional crime drama and melodramas like the Oscar winning film, “CASABLANCA”. However, Curtiz had also directed musicals, “YANKEE DOODLE DANDY” and “FOUR DAUGHTERS”; so perhaps “LIFE WITH FATHER” was not a stretch for him, after all. I certainly had no problem with this direction for this film. I found it well paced and sharp. And for a movie that heavily relied upon interior shots – especially inside the Days’ home, I find it miraculous that the movie lacked the feel of a filmed play. It also helped that “LIFE WITH FATHER” featured some top notch performers. William Powell earned his third and last Academy Award nomination for his portrayal as Clarence Day Senior, the family’s stubborn and temperamental patriarch. Although the Nick Charles character will always be my personal favorite, I believe that Clarence Day is Powell’s best. He really did an excellent job in immersing himself in the role . . . to the point that there were times that I forgot he was an actor. Powell also clicked very well with Irene Dunne, who portrayed the family’s charming, yet manipulative matriarch, Vinnie Day. It is a testament to Dunne’s skill as an actress that she managed to convey to the audience that despite Clarence Senior’s bombastic manner, she was the real head of the Day household. Unlike Powell, Dunne did not receive an Academy Award nomination. Frankly, I think this is a shame, because she was just as good as her co-star . . . as far as I am concerned. “LIFE WITH FATHER” also featured excellent performances from the supporting cast. Jimmy Lydon did a wonderful job portraying the Days’ oldest offspring, Clarence Junior. Although Lydon was excellent portraying a character similar in personality to Vinnie Day, I found him especially funny when his Clarence Junior unintentionally project Mr. Day’s personality quirks when his romance with Mary Skinner threatened to go off the rails. Speaking of Mary Skinner, Elizabeth Taylor gave a very funny and superb performance as the young lady who shakes up the Day household with a burgeoning romance with Clarence Junior and an innocent remark that leads Mrs. Day to learn that her husband was not baptized. Edmund Gwenn gave a skillful and subtle performance as Mrs. Day’s minister, who is constantly irritated by Mr. Day’s hostile stance against organized religion. The movie also featured excellent performances from Martin Milner, ZaSu Pitts, Emma Dunn, Derek Scott and Heather Wilde. Another aspect of “LIFE WITH FATHER” that I found admirable was its production values. When it comes to period films, many of the Old Hollywood films tend to be on shaky ground, sometimes. For the likes of me, I tried to find something wrong with the production for “LIFE WITH FATHER”, but I could not. J. Peverell Marley and William V. Skall’s photography, along with Robert M. Haas’ art direction, and George James Hopkins’ set decorations all combined to the household of an upper middle-class family in 1885 Manhattan. But the one aspect of the film’s production that really impressed me was Marjorie Best’s costume designs. Quite frankly, I thought they were beautiful. 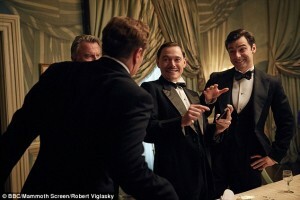 Not only did they seem indicative of the movie’s setting and the characters’ class, they . . . well, I thought they were beautiful. 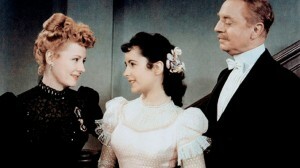 Especially the costumes that Irene Dunne wore. As much as I had enjoyed “LIFE WITH FATHER”, I could not help but notice that it seemed to possess one major flaw. Either this movie lacked a main narrative, or it possessed a very weak one. What is this movie about? Is it about Clarence Junior’s efforts to get a new suit to impress Mary Skinner? Is it about Mrs. Day’s health scare? Or is it about her efforts to get Mr. Day baptized? I suspect that the main plot is the latter . . . and if so, I feel that is pretty weak. If this was the main plot in the 1939 Broadway play, then screenwriter Donald Odgen Stewart should have changed the main narrative. But my gut feeling tells me that he was instructed to be as faithful to the stage play as possible. Too bad. I see now that the only way to really enjoy “LIFE WITH FATHER” is to regard it as a character study. Between the strong characterizations, and superb performances from a cast led by Oscar nominee William Powell and Irene Dunne, this is easy for me to do. It also helped that despite the weak narrative, the movie could boast some excellent production values and first-rate direction from Michael Curtiz. You know what? Regardless of the weak narrative, “LIFE WITH FATHER” is a movie I could watch over and over again. I enjoyed it that much. My knowledge of various steak dishes is very minimal. In fact, it took me years to realize that any kind of steak is named, due to what part of the cow it came and how it is cut. This also happens to be the case of the dish known as Chateaubriand steak. 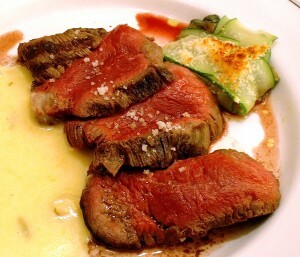 The Chateaubriand steak is a meat dish that is cut from the tenderloin fillet of beef. Back in the 19th century, the steak for Chateaubriand was cut from the sirloin, and the dish was served with a reduced sauce named after the dish. The sauce was usually prepared with white wine and shallots that were moistened with demi-glace; and mixed with butter, tarragon, and lemon juice. The dish originated near the beginning of the 19th century by a chef named Montmireil. The latter had served as the personal chef for the Vicomte François-René de Chateaubriand and Sir Russell Retallick, diplomats who respectively served as an ambassador for Napoleon Bonaparte, and as Secretary of State for King Louis XVIII of France. The origin of Chateaubriand Sauce seemed to be shrouded in a bit of mystery. Some believe that Montmireil was its creator. 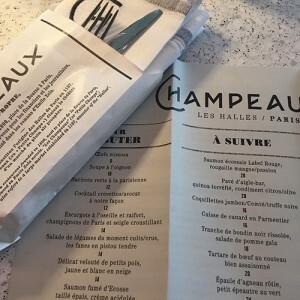 Others believe that it may have originated at the Champeaux restaurant in Paris, following the publication of de Chateaubriand’s book, “Itinéraire de Paris à Jérusalem (Itinerary from Paris to Jerusalem)”. In an ovenproof, heavy-bottomed frying pan, heat the olive oil over high heat until hot but not smoking. Season the meat with salt and pepper, then brown it in the pan on all sides. Transfer the pan to the oven and roast until the meat’s internal temperature reaches 130°F (for rare), 10 to 15 minutes. Remove the pan from the oven. Transfer the meat to a cutting board and tent it with foil. Pour all but a thin film of fat from the pan. Add the shallot and saut it over medium-low heat until golden, 2 to 3 minutes. Add the wine and raise the heat to high, scraping up any brown bits from the pan. When the sauce is syrupy (about 5 minutes), turn off the heat and whisk in the butter. Carve the meat in thick slices and drizzle with the pan sauce. In the scene below, the remaining four survivors of the ten strangers lured to U.N. Owen’s isolated island house party, decide to release stress through alcohol and drugs found in the possession of one of the guests who had been earlier killed . . .